Since October my husband has been doing a great deal of walking. Last month I decided to join him. I love the scenery, the exercise, the quietness of our time walking. Most of all I love the company. In one place on our walks we pass in front of a business. The roof-line overhangs the sidewalk a bit. Most of the sidewalk in that area is a dark grey, but along this spot there is a small bright white line. This line has been caused by the rain falling off the roof line and splashing along that strip of sidewalk. The water has washed away the dirt by repetitive pounding. "Not by works of righteousness which we have done, but according to His mercy He saved us, by the washing of regeneration, and renewing of the Holy Ghost." ". . .even as Christ also loved the church, and gave Himself for it; That He might sanctify and cleanse it with the washing of water by the Word, That He might present it to Himself a glorious church, not having spot or wrinkle, or any such thing; but that it should be holy and without blemish." We are like that bright strip on the sidewalk, our sins have been washed away our Lord. He has made us a "new creation," bright and clean. It makes me think of the words to an old hymn. filled with the Holy Ghost I am. As a Labor & Delivery nurse, I am often called to also be a scrub nurse during the surgeries we have in our unit, mostly Cesarean Section deliveries, and our patients are almost always awake at the time. This means she can hear everything that is said during her surgery. I remember when our son was born, also by C-Section, my doctor and my husband spent the whole time discussing baseball, because it was the time of year for the World Series. Although I'm not much of a baseball fan, I can still remember parts of the conversation three decades later. One thing a patient never wants to hear during her surgery, however, is "Uh-oh." Once, when I was the scrub nurse, I wanted to throw an unused and unwanted piece of disposable equipment off the scrub table. I aimed for the nearby garbage, but instead nearly hit the Nursery nurse. A surprised "Uh-oh" issued out of my lips. Immediately, all eyes turned to that sound. The great majority of time when this utterance is made, as with mine, it is over some minor occurrence, such as a dropped instrument or because something unexpected has occurred. Rarely does it even have anything to do with the surgery itself. The patient, however, whose view is hidden by a drape at the head of the bed, has no idea the "Uh-oh" is not significant. Fortunately, there are no "Uh-oh" moments with our God. Our Lord has seen and anticipated every moment we will experience in our lives. He knows the things we know infinitely better than we do and He knows completely the things we have no idea about. They may be "Uh-oh"s to us, but not to Him. What a comfort! There is nothing that can befall us that takes Him by surprise, and He has promised to work all things, all things -- the "Uh-oh" moments, too -- for our good. This should be a balm to our heart and an encouragement to our spirits to know our God is great enough to even take care of the "Uh-oh" moments. I am writing this with squinting eyes because I have forgotten to replace my old contacts with new ones, which means everything is just a little more difficult to see. My difficulty is of my own making. I have the solution to the problem in my bathroom cabinet. . .a box of brand new contacts, but I haven't availed myself of the solution, hence I am reaping the consequences of my choice. There are times in our lives when the issues of the day, the circumstances, even our own feelings, cloud our spiritual vision. We can't see the Lord's vision in our lives as clearly as we think we should. In those grey moments, we must avail ourselves of the things the Lord has given us to help us "see" more clearly. We must first avail ourselves of His Word. Then we must avail ourselves of the teachings of those who rightly divide the Word of truth, and of the faithful counsel of our fellow Christians. The Lord desires for us to "see" the way clearly. Let us take advantage of every help He has given us to walk in the path He has set before us. Glen and I were watching an old movie the other night with our youngest daughter. In the movie, the mother was reading a story to her young daughter at bedtime. As the mother read, the daughter slowly drifted off to sleep. The mother then rose very quietly, knelt down and gently kissed her daughter's cheek. Immediately I wondered how many times I had done the same thing with my children, and now my grandchildren. How many kisses had I placed on little children who would never have any idea of the token of love bestowed upon them. In fact, how many mothers over time had done just the same thing? Then it hit me. . .how many times had our Heavenly Father bestowed His great love on me of which I was unaware? Perhaps it was the provision of a need, perhaps a comfort or encouragement which came my way. Perhaps it was wisdom to make the right choice. The Bible tells us the Lord has loved us "with an everlasting love," (Jeremiah 31:3.) In fact, we can never know the fullness of His love for us and we can never, ever be separated from it. Along the eighteen mile drive to a local church where my husband teaches Sunday School each week, are reminders and aids to not sleep while driving. On each side of the very edge of the road are rumble-strips, or as I call them, wake-up strips. These raised, grooved patterns in the pavement, just before the shoulder, create an audible rumbling sound as well as a vibration in the steering wheel when a vehicle drives over them. This sound and vibration can wake a sleeping driver--giving time to regain control of the vehicle and get back in their lane. They serve the purpose of alerting us when we are going the wrong way. The Lord has given us wake-up strips as well, primarily the Holy Spirit. He works in us to lead us into the right path and reminds us when we start edging off our "lane." How wonderful of our Lord that He not only miraculously saves us -- at the cost His dear Son's life -- but He comes to live inside of us to lead us, guide us, correct us, encourage us and comfort us. We were in service this afternoon and prepared to sing our first hymn, "Count Your Blessings." Before we could start singing, Mrs. Anna, one of the residents there asked, "Do we have time for that?" Of course she wasn't asking if we had time to sing the song, but rather did we have time to count all our blessings. We replied that even all eternity will not be long enough to count the many blessings our Lord has showered upon us. Sometimes when I am going to work at night, perhaps still weary from the night before, I will encounter another employee also trudging in. Inevitably, they will either ask how I am, or make some comment about having to come to work. I have learned not to travel down the slippery slope of begrudging the fact I am going to work. Instead I have adopted the truthful answer, "I am happy to have a job to come to." There are so many blessings, so many positive things in our lives which our enemy would love to deceive us into believing are negatives. Sometimes it is things we do, situations we are in or even people we know. When those temptations to being negative come to us, the best thing we can do is to begin counting all the rich blessings we have been given. We can begin with our very breath! As I write this, I am safe and comfy in my wonderful room. My house and all that is in it are things I count as blessings. Beside me is my sweet beagle, Sparrow, one of the most joyous blessings of my life. Beside her is my husband, inarguable the greatest blessing of all. I could send my thoughts in ever-widening circles from this room and each step of that journey would reveal more and more blessings our Lord has bountifully bestowed. My husband and I have been walking a lot lately and I mean a lot. My longest distance so far is 8.5 miles, but he has gone several miles further than that. One issue I have had to deal with on these long walks is the result of my shoes rubbing against my feet. . .blisters. Blisters occur when excessive friction causes the layers of the skin to separate. To heal the area, and create new skin, the resulting space fills with fluid. Once you have developed blisters, it is important to treat them correctly. Above all else, one must watch for any signs of infection, to which foot blisters are especially prone. In the last few weeks, I have become very skillful at treating blisters, but not so much at preventing them. I have tried different shoes, different socks, applying things to my feet before walking, but nothing has consistently kept the blisters at bay. I haven't yet found the perfect change. In our lives as Christians, we can develop blisters -- blisters of the heart, or soul. Anytime we rub against the will of God in our lives we will feel the result of that friction. He loves us too much to allow us to continue in our error, in fact, He loves us more than we could ever imagine. If we follow a wrong path, the last thing He wants is for us to continue there. He will guide us, lead us, correct us, back to His path, to His perfect change for our lives. We will, however, have to suffer the consequences of our wrong choices. Thankfully, our God delights in mercy, (Micah 7:18,) and He wants us to be healed of our blisters. He will make His path plain before our face so that we can walk in His light. And He will heal our wounds. "He healeth the broken in heart and bindeth up their wounds." For the last few years of college, my youngest daughter has studied ceramics. She has learned how to throw things on the wheel, shape them, glaze them and fire them in the kiln. A few months ago she had the opportunity to fire some of her pieces in a wood kiln in our area. The person who owns the kiln fires it only rarely, so this was a great opportunity for her. She had made a vase with three globes on it that she particularly liked. It was perfectly shaped and beautifully carved. I over-heard her telling a friend that this was her favorite piece. She went on to show her friend how one side had a different coloration because of the ash on the piece. Also, she said it could be determined which side the vase was on while firing because of the differing coloration. Isn't that just like us and the Lord? If we were never to be put into the kiln, close to the fire, we would never be strong and sturdy, fit for use. The raw clay is good for nothing but to make vessels to be fired. As we submit to the fires, the ash colors us, it changes us, it makes us into His image. We look and feel different once we have been in the fire. In 2005, our hospital celebrated its 30th anniversary. The week of the big celebration, my family and I were on vacation in Washington, DC. When I returned to work I was told I had to go down to Administration. This was an edict no one wanted to hear, it rarely meant something good. However, the sly look my boss gave me made me think perhaps this was one of those rare days. When I went to Administration, I was escorted into the Boardroom and noticed the large table was covered with gift bags. I was handed a bag and thanked for being an employee of the hospital. When I opened the bag I found a beautifully cut glass engraved with the hospital's name and the year. But the best was inside the glass. Inside each glass, in each bag, was a clean, crisp fifty dollar bill. This was the hospital's way of saying "Thank you." I was surprised and, of course, very pleased. I thought of this the other day when the topic turned to grace. Grace is us getting something we don't deserve, something unexpected. Mercy is us not getting what we do deserve. So many of the New Testament epistles begin with a salutation of grace and mercy. the Son of the Father in truth and love. There is nothing we can ever do to deserve God's grace, it is His unmerited favor toward those who believe in His Son. There is no way we can ever understand the depths of His mercy to us. All we can do is to fall on our knees and thank the Lord that He is Who He is, a God of peace, grace and mercy to us all. It was chilly the other day when my husband and I were walking and as the wind whipped around my head I wished I had a hat appropriate to wear for the activity. Long ago I crocheted quite a bit, but I haven't done it for years and years. 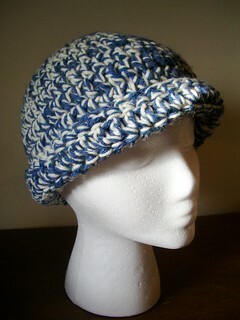 I didn't think crocheting a hat could be too difficult, after all, it's just a series of circles. So I grabbed some yarn the next time I was at the store and then sat down to make myself a hat. I had to look up some directions for the flower on my hat, but overall I was pretty pleased. If you know anything about crochet, you are aware that it consists of wrapping the working material, often yarn, around a hook one or more times and pulling the resulting loops through a previous stitch. I found it fascinating, looking at the finished project, that the one hat was composed of hundreds of stitches. And yet, if one pulled on the yarn from the very last stitch, the whole hat would unravel into one single, long piece of yarn. As Christians, the Bible refers to us as "one body." There are millions of individual Christians, but we still are one body, with one purpose and one faith. Our purpose is to glorify the Lord Jesus Christ. There are times my hat may get pulled from outside sources, in fact, I stretch it a little just putting in on my head. This pulling and stretching only serves to pull the stitches more tightly. We, too, may be pulled and tempted by things outside of us. Instead of allowing that to unravel us, let us have faith that the Lord will use that to strengthen our faith in Him. "Behold how good and how pleasant it is for brethren to dwell together in unity!" One of the great truths for us as Christians is that whatever dark, difficult, painful place we may face in our lives, there will always be Someone waiting there for us. I was fourteen when my grandmother died and it was my first experience with the death of a loved one. I was very nervous about going to the funeral home. My mother had eight siblings, so I knew there would be plenty of people there, but just anyone would not do. I wanted someone who would know how I felt and be willing to help me through. My cousin Missi was just the person. Our mothers had married brothers, so she was actually my double-first cousin, and we shared all the same family members. She was only six months younger than I was, so I knew she was probably feeling the same trepidation about the funeral home. When we arrived, it was so comforting to see her waiting outside for me. It was as if a huge weight had melted off my shoulders. Together we followed our family members to the viewing room and then to the casket. Perhaps because we shared the experience, it didn't seem nearly as frightening as I anticipated. We all have events in our lives, both actual and imagined, that will cover us with a shroud of fear, if we let it. The "what-ifs" of life can be truly frightening. There is a "is-so," however, to answer every "what-if." What is true is that every situation we can face --no matter how sorrowful, how frightening, no matter how great the loss-- The Lord Jesus will be waiting there for us. He knows our sufferings, our temptations to fear, our feelings of frailty. And He is there to strengthen, to guide and to comfort us. There is no where we can go that He is not there waiting for us. Have you ever wondered why it is so relaxing at the beach, beside a waterfall or after a thunderstorm? It isn't just the beautiful scenery or rhythmic sounds they provide, it is the air. 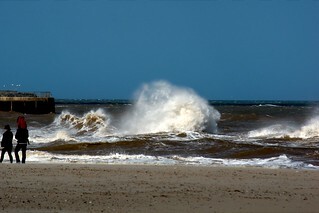 Water crashing on the shoreline, or falling upon rocks, or being exposed to lightening in the sky, causes the molecules in the air to break apart, losing their charge and thereby becoming negatively charged ions. These negative ions, found in much higher levels in these settings than in the average home or office building, are odorless, tasteless, and invisible. Once they reach our bloodstream, it is believed they produce biochemical reactions which increase the flow of oxygen to the brain, resulting in higher alertness, decreased drowsiness and more mental energy. They may also have some protective action against germs in the air and particles which cause sneezing and coughing. It is important to remember that the way these ions become negatively charged is by crashing upon the sand, or rocks, or being exposed to lightening. For the ions, I suppose, this is not a positive thing (further underlining the name "negative ions.") But our response when exposed to them is generally positive. Throughout our lifetimes we will all face negative circumstances. We will find ourselves crashed upon the shorelines of our lives. We will fall upon hard rocks, or perhaps find ourselves "between a rock and a hard place." We may feel the fire and burn of lightening in our lives. But for the Christian, everything that appears to be negative on the outside is a tool in the Lord's hand to work out the very best for us. In the darkest of nights He will give the sweetest songs. In the moments of deepest griefs He will be our greatest comfort. There is no path we can walk, no trial we can face, no heartache we will experience that He is not there before us. He knows the way and He knows us and He has been, is and will be, all that we will ever need in every situation. but rather Who we know in that lifespan." When I was in nursing school the word "mastery" had a special meaning for us. The school used this term to describe the depth of our knowledge about our lessons. When we were tested on each lesson, there was a minimum grade we had to score to continue on in our studies. If we didn't reach that grade, we were given two more opportunities to be tested on the information. If after that we failed to obtain "mastery" after three opportunities, we were out of the program. Only once did I have to retake a test. I can remember my furious studying before taking the test for the second time. By the time I put pen to paper, I had true "mastery" of the subject. In John 17 we are told life eternal is to know the true God and His Son, Jesus Christ. In this verse the word "know" does not have the definition of a casual, or superficial knowledge. It is a word used for the most intimate, in-depth of knowledge. It is the knowledge of mastery. May we always continue on a path of ever-learning, ever coming more and more to know the Lord and His Son. This is life and this will be the eternal quest of our hearts. Never, even after eons of eternity will we be able to claim mastery of the depths of our God. Never will we be able to fully know His love, His mercy, His understanding. But, oh, the quest will be glorious.